Support Voices for Vaccines and its podcast by donating here. 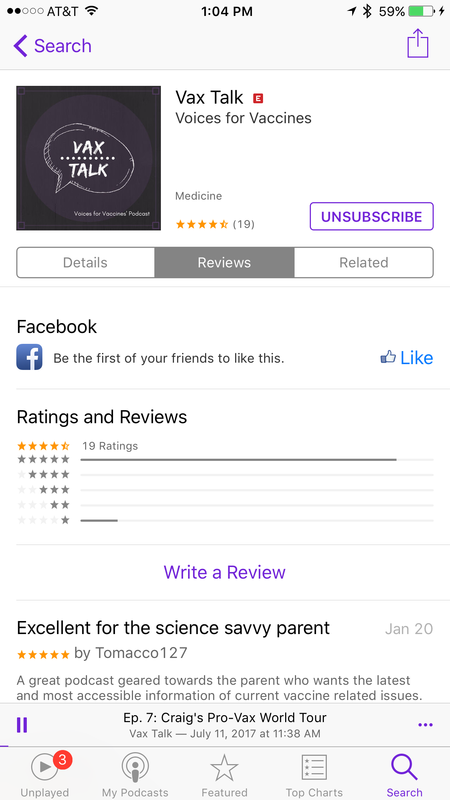 Vax Talk is the podcast for people who want to do something about outbreaks of vaccine-preventable diseases and who understand that knowledge is power. We will discuss the latest news about vaccines and the impact they have on our communities, our families, and our friendships. Subscribe now at Apple Podcasts, Google Play, PodBean or Stitcher. You can also listen to these episodes on YouTube and Cast. And leave a 5-star review! A few months ago, Ethan Linenberger was just a teenager with a Reddit account. He used that account to find out how to get himself vaccinated, and now he is one of the youngest–and smartest–vaccine advocates around. We talked to him about vaccines, social media, and how teens can engage in this space. Find Ethan at his website to learn more about what he has done. Vaccine buzz is buzzier lately, with a new, young advocate traveling to Washington, D.C. to testify about why he got vaccinated after his mother had refused to vaccinate him and with anti-vaccine activists trying to “inundate” the ACIP meeting at the CDC. We will tackle those topics and talk to three special guests about ACIP updates. L.J. Tan discusses with us the latest flu data, Lori Boyle talks about why nurses need to represent, and Amy Pisani talks HPV and PCV. It’s been more than a decade since a U.S. court, in an omnibus proceeding, found that vaccines do not cause autism, but that finding has sparked a new conspiracy theory, thanks in part to Robert F. Kennedy, Jr. We invited vaccine law expert Dorit Reiss to our show to discuss with her how this new conspiracy theory does not hold up to scrutiny. The HPV Vaccine seems to have a special place–not as a cancer-preventing tool but as something people sometimes fear. But when the science is clear that this vaccine is safe and needed, why do some refuse it? For answers, we talk to Dr. Noel Brewer, a health behavior expert and chair of the National HPV Vaccination Roundtable. Do you get your flu shot? Does everyone you know get one, too? We invited Dr. LJ Tan to talk to us about last year’s flu season, this year’s flu forecast, flu vaccine uptake, and Riverdale. Dr. Peter Hotez is a pediatrician, a vaccinologist, and a parent of Rachel, who is autistic. His new book, Vaccines Did Not Cause Rachel’s Autism, leaves no wiggle room for doubt about whether or not he embraces scientific consensus concerning vaccines. In this episode, we talked to Dr. Hotez about his book, about his daughter, about why vaccines cannot cause autism, and about the anti-vaccine movement. We ask all of our listeners to purchase this book and then donate it to their pediatrician’s office! If measles has been eliminated from North America, what’s up with these outbreaks? Is it even possible to get rid of it globally and for good? We invited CDC’s Dr. Mark Papania and Dr. Manisha Patel to answer all of our measles eradication questions. This episode was sponsored by the Task Force for Global Health in honor of Dr. Samuel Katz and Dr. Walter Orenstein, both of whom have played critical roles in eliminating measles. A PICU nurse contemplates swabbing a measles patients to infect her own child. A nurse practitioner makes a video about how to school pediatricians on vaccines. What is a pro-vaccine advocate to do? We invited Nurses Who Vaccinate’s Melody Butler to discuss all things anti-vaccine nurses. At age 44, Jason Mendolsohn was diagnosed with Stage IV HPV throat cancer, and now he’s on a mission to convince families to prevent this cancer in their children through immunization. Please note: This episode is appropriate for kids of all ages, and we invite everyone to listen. We don’t give young people enough credit. Being brave and getting their vaccines does a lot of good in the world, so says this week’s guest. Ethan Posard has a film credit and has published a book–and he’s only 17. Meet vaccine advocacy’s most influential young hero in this week’s episode about teens, kids, vaccines, and advocacy. New parents have many questions about vaccines. What is the best way to answer those questions and to handle potential vaccine concerns? We talked to Mayo Clinic’s Dr. Bob Jacobson and tapped into his wealth of experience about all things vaccines before age two! It’s National Immunization Awareness Month, week 1. We are focused on vaccines during pregnancies, the two-for-one that protects both mom and baby. To talk about this important topic, we invited What to Expect’s Heidi Murkoff to share her expertise and give us all advice about how to reach women during pregnancy and encourage immunization. Wear one of our our NIAM t-shirts and display your photo on our Why I Choose gallery! Karen traveled to Atlanta for the National Immunization Conference and met many amazing people, a few of whom are featured in this episode. Nathan talks about the great pro-vaccine advocates we know, and they both discuss why we all advocate and what we can do to create more vaccine confidence. Nathan and Karen talk to Every Child By Two’s Amy Pisani about how the immunization challenges have changed over the decades and what challenges we face in our work together combatting vaccine-preventable diseases. Episode 16: What about the dads? So much of vaccine advocacy is aimed at mothers, but where are the dads in all of this? To find out, Nathan and Karen talked to Dean Masello, writer, comedian, and SAHD. Find him at wokedad.com. This episode was made possible by a generous donation from Immunization Action Coalition: www.immunize.org. Karen and Nathan host Dr. Chad Hayes and Natalie Newell from the Parenthetical Science podcast for a rousing discussion about how parenting is harder than it needs to be and how people fall into the neverending woo rabbit hole. Nathan and Karen talk to Dr. Paul Offit–head of infectious diseases at Children’s Hospital of Philadelphia and all around good guy. Dr. Offit took the time to answer questions our listeners submitted online, covering topics from influenza to pertussis to advocacy. It’s Cervical Cancer Awareness Month! In this episode, Nathan and Karen talk to Tamika Felder about her battle with HPV-caused cervical cancer and her organization, Cervivor. In November, Nathan and Karen traveled to Bethesda, MD to record a live episode at NFID’s Vaccinology Course. They discussed vaccine messaging with the good people there, and now, as a holiday treat, are sharing it with you. Watch for more great VAX TALK episodes in 2018, and support our mission. This episode was made possible through the sponsorship of NFID. Thank you, NFID! Click to the next page to listen to our first season of podcasts!